and the nature that surrounds them." then adds low brass clusters for striking, scary effect. Fresh, effective timbre. Sanko contribution (especially "What God Wants") lends aura of mysticism, serenity to score. Two disparate musical elements actually compliment each other to perfection!" all of which confirm my initial thoughts that this is a composer to take very seriously." as well as utter chaos through the use of a string quartet ..."
"masterfully eerie use of sound and original score..."
8. Do You See It? 16. What Am I Seeing? "When Larry first approached me about working on The Last Winter, I was amazed at the world he and his collaborators had created. Capturing or creating the right mood is of paramount importance for me as a composer, and everything Larry showed me was a treasure of inspiration for that end: The amazing Arctic locations and cinematography, and the extremely nuanced story of normal people whose everyday world slowly unravels through the presence of a supernatural element and a blind eye to their environment. What more could I ask for? I couldn’t wait to get started! Larry and I got to work first discussing concepts for the music. He knew he wanted the film to start with more of an ambient sound scape transitioning to a fuller musical score. We zeroed in on the main ideas we would be addressing with the music, namely a sense of loss, as expressed in Hoffman’s journal entry “There’s No Way Home,” and then the growing sense of insanity and the characters’ questioning of their own experiences. The music is more traditionally thematic where it is expressing loss, and more avant-garde and progressive where it is dealing with the supernatural and the questioning reality. As part of our process, Larry and I played a lot of music for one another at the beginning. The composers most helpful for our discussions were Beethoven, Gorecki, Ligeti, Penderecki, Scelsi, and Michael Nymann. When it came to getting musicians, I was eager to get Flux Quartet involved. I had worked with Flux before, and I frequently work with Dave Eggar and Tom Chiu. The group’s intimate knowledge of certain modern classical literature made them an ideal choice given our direction. Along with Flux we added bass and a quartet of low brass. The bass ocarina offered a tremendous eeriness and a interesting transition from ambient to musical score." JEFF GRACE (music score) began his film and television music career in 1998 as a composer at the New York music house Ruggieri Music. From 2001 to 2004 he was an assistant to Academy Award winning composer Howard Shore working on the three films of Peter Jackson’s THE LORD OF THE RINGS trilogy, Martin Scorsese’s THE GANGS OF NEW YORK, David Cronenberg’s SPIDER, David Fincher’s PANIC ROOM, and Frank Oz’s THE SCORE. Through that association, Jeff worked with such artists as Renee Fleming, Annie Lennox, Isabel Bayrakdarian, Kronos Quartet, The London Philharmonic Orchestra, Terry Edward’s London Voices, and top studio orchestras and musicians in London, Los Angeles and New York. Grace most recently scored the independent horror films THE ROOST and JOSHUA. THE ROOST, which was ranked as one of the top-10 films of 2005 by the Bloody Disgusting web site, opened theatrically in the US and UK earlier this year and will be released on DVD in the USA October 2006. Active as a composer for concert and stage, Jeff was selected for American Opera Projects’ 2005-2006 Composers And The Voice Series. Jeff worked with composer Robert Ruggieri on scores for A Hymn for Alvin Ailey (ballet and film) and Double Exposure (ballet) for the Alvin Ailey American Dance Theatre (directed and choreographed by Judith Jamison). He has also worked with Gil Goldstein, providing orchestrations for trumpeter and Verve recording artist Roy Hargrove. ANTON SANKO (ambient score) was born and raised in New York City. He attended NYU, where, majoring in music theory and composition, he studied Stockhausen by day and played in downtown Manhattan’s new wave clubs by night. In addition, he also found time to study guitar and composition with jazz legend Ralph Towner. It was also during this time that he played with the avant-garde acts Shox Lumania and Our Daughter’s Wedding. From 1985 to 1991, Sanko played keyboards with Suzanne Vega. In 1989, he recorded, co-produced and co-wrote songs on Days of Open Hand (released in 1990) with Vega. He toured to support that album as Suzanne’s music director. Sanko continued to produce, play and write with other artists including Anna Domino, Jim Carroll, Lucy Kaplansky, Percy Jones, Kashif, and Sonny Okosun. When the opportunity to provide scores for films presented itself, Anton found a newcalling. His credits include cult films like PARTY GIRL, RIPE, and AN OCCASIONAL HELL, as well as SCOTLAND, PA and NYACK JUMPERS. He has scored films for television including ABC’s recent irreverent biopic of Donald Trump, “Ambition”, TNT’s 2004’s release “Bad Apple” starring Chris Noth and other television projects such as Peter Berg’s “Wonderland”, and HBO’s “Subway Stories”. Most recently, Sanko scored the Sony Classics release SAVINGFACE Alex Steyermark’s ONE LAST THING, and Tom DeCillo’s upcoming release DELIRIOUS, starring Steve Buscemi, and an episode of “Masters of Horror” for director Brad Anderson (THE MACHINIST, NEXT STOP WONDERLAND). TOM LAVERACK (songwriter, closing credits) Tom Laverack's newest release, Cave Drawings , almost three years in the making, showcases the best of Laverack's songwriting, beautifully supported by Mark Ambrosino's skillful production and a stellar band. Cave Drawings offers an emotionally and musically diverse range for the listener, while tapping into the classic 50's and 60's style of prodution. It is folk-rock with a soulful delivery. Having drawn comparisons to an array of distinguished singer-songwriters - from Paul Westerberg to Bruce Springstein - Bob Dylan to Tom Waits - Laverack shows his preoccupation with the darker sides of life, while retaining a quiet belief in the sacredness of our connections. Tom Laverack has been writing and performing music since the age sixteen, living a majority of his adult life in New York City. In 1987, Laverack along with long time friend and collaborator, Larry Fessenden, co-wrote and produced their first album Sentimental War (Earhorn Disks) as the band Just Desserts. Recorded with Wharton Tiers (Sonic Youth, Dinosaur Jr), Sentimental War was both a concept album and acoustic-driven folk-rock tour-de-force, drawing comparisons with Tom Waits, John Prine, Elvis Costello, The Clash, and The Violent Femmes. The album received rave reviews and extensive college radio airplay. Just Desserts also released the paired down EP, Cold Hearts and Whiskey from which BarNone records issued a limited-release '45' featuring the song Almost Shook You Up. In 1997, Just Desserts released their second full-length album Give Up The Ghost (Earhorn Disks), garnering high praise and extensive college and AAA radio airplay. In addition to their collaboration as Just Desserts, Fessenden has featured Laverack's solo recordings in all of his feature films, beginning with No Telling in 1991, a film Laverack also scored . Laverack contributed two songs to Fessenden's second feature film, Habit, a release which went on to earn Fessenden an Independent Spirit Someone To Watch Award, and composed the song Hold Out(from the CD Gift Horse ) for Fessenden's next release Wendigo, which earned the director further accolades and awards, including winning the 2001 Woodstock Film Festival. Horse was only finally released in November 2005, distributed by Hayden's Ferry/Rustic Records. Having been involved in human service work since his arrival in New York City, Laverack continues to work as a social worker and administrator at a community mental health agency. "There is an even better album hidden within MovieScore Media's release of The Last Winter, one that eschews the long, barely audible snowscapes of Anton Sanko's sound design. Listening to The Last Winter from beginning to end, I fell asleep. Sanko's shimmering soundscapes, while necessary in the movie no doubt, lulled me into passivity, then torpor. I was not a fan of David Julyan's The Prestige either which, likewise, consisted of long stretches of ambient music and softly focused harmonic progressions. I know there are fans of drones and ambiences, as well as whole satellite radio channels dedicated to sound design and ambient music. Perhaps those who regularly tune in to Hearts of Space and Star's End will be able to appreciate Sanko's contributions to the soundtrack. I did find "Do You See It?" to be interesting towards its middle, when the parade of low bells and drones makes way to creepy, fluttery sounds akin to bats flying helter-skelter. Disconcerting, to say the least, but the snail-paced atmospherics have a way of diluting the impact of Jeff Grace's much more engaging score. Jeff Grace caught my attention with MovieScore Media's earlier double release of his work on The Roost and Joshua, both of which exploited a string quartet for all of its worth. Fans of The Roost expecting more dissonant mayhem and crazy glissandi might be disappointed by The Last Winter: while The Roost was all about fright, The Last Winter is about suspense and paranoia. A cue like "What Am I Seeing?" echoes the harsh, lamenting glissandi of Grace's earlier work, building to what we would expect to be an all-out assault by percussion and strings. Instead, it fades away and is replaced by a steady wind effect, dissonant and pale, over which disturbing col legnos start to erupt like popcorn kernels. The biggest difference between the two scores and Grace's most significant contribution to The Last Winter is an epic and dramatic theme for string quartet that is introduced in "North" and to which the composer returns again and again to give the stark picture a touch of humanity. It is a beautiful melody and its return in "The Last Winter", painfully articulated by the cello, is even more touching than its introduction. It demonstrates Grace's ability to express beauty as well as utter chaos through the use of a string quartet and shows a certain kinship with Howard Shore's music. The rest of Grace's score shares some similarities with James Newton Howard's style, especially in a cue like "Elliot" where a delicate theme for piano, more rhythmic than melodic, runs through, a subtle yet catchy release from the pervading tension. The following cue, "To Ft. Crow", possesses an early music vibe, setting things in motion to the sound of thick, scratchy strings, creating a sense of movement enshrouded in human nobility. Meanwhile, a piece like "Dawn" shows Grace's sound design, more acoustic than electronic, dripping with atonality, tense with discordant tremolo violins, violas, celli, and basses. Sanko's ambient contributions are not bad, and Sanko will have his defenders. I find the idea of bringing two composers with different approaches into a single movie to be an interesting one and I am sure the movie benefits from this musical duality. On album, however, I found Sanko's music to be sleep-inducing, while Grace's score should have shone brighter. The Last Winter does confirm my opinion of the composer: he definitely has something good going on. Let's hope his next score shows him expanding his horizons: I would not want to see him typecast as "that guy that does the crazy things with the string quartet". There are worse lots in life, I'm sure, but a talent used in repetition is wasted talent nonetheless." "Original soundtrack from Larry Fessenden film set amidst Artic locations, starring Ron Perlman, James Legros, Connie Britton. CD offers both original Jeff Grace score for modest ensemble (string quartet plus horn, two trombones, tuba, piano, bass ocarina) & ambient score by Anton Sanko. Former allows degree of traditional orchestral scoring, latter brings in electronic textures, soundscapes. Grace uses strings in haunting manner with abundance of minor-key harmonies, then adds low brass clusters for striking, scary effect. Fresh, effective timbre. Other moments invoke complexity of Penderecki string music. Sanko contribution (especially "What God Wants") lends aura of mysticism, serenity to score. Two disparate musical elements actually compliment each other to perfection! "Running Out Of Road" written, performed by Tom Laverack concludes album. Anton Sanko records ambient music, Jeff Grace conducts Flux Quartet plus brass." "When an oil company drilling team head to Northern Alaska’s icy reaches to establish a new base they find themselves in a terrifying physical and mental wilderness, following the mysterious death of one of the crew. Terror and paranoia spreads as the team become deeply disoriented; not knowing what killed their friend preys on their minds, but is it the only thing preying on them? The Last Winter is a fine psychological horror from director Larry Fessenden, who takes his lead from the likes of The Thing, and stars Ron Perlman (Hellboy, Alien Resurrection) as the leader of the doomed drilling team. To support his frosty tale, Fessenden recruited two composers, Jeff Grace and Anton Sanko. Each would tackle a different side to the film’s story; Grace was charged with illuminating the human side and assembled the Flux Quartet and a number of orchestral flavours, delivering a two tone score that captures a great sense of loss, as well as the creeping horror. Sanko, on the other hand, was asked to create ambient music that would signify the paranoia and mental stress. He achieves this with a series of eerie landscapes, built around layers of sound, reverb and effects. Grace’s efforts outweigh Sanko’s on this album from MovieScore Media, with the latter’s thinly scattered throughout. The former’s orchestral score is sublime, taking a very classical approach in the first instance (‘North’) and alternating between that very romantic style and an altogether more avant-garde one. I was hugely impressed with his music for The Roost (also available from MovieScore), so was looking forward very much to hearing this new horror score, and I wasn’t disappointed. Grace manages to create the most unnerving sounds with just a few instruments; the agitated strings in cues like ‘Hallucinations’ and ‘Dawn’ are truly nerve-shredding, with layers of heavy, moaning tremolo and clashing, weeping glissandi. He achieves a similar feel with a completely different set of tools later, in the cue ‘What Am I Seeing?’, which is a remarkable barrage of bass woodwind, ghostly ocarina and a bold, brassy finale that literally screams itself out. This is of course great fun to listen to, but doesn’t take over the score. Grace balances this edgy, agitated horror with a lighter piano motif for the character of ‘Elliot’, first heard in the cue ‘Footprints’. It’s a plaintive theme, sparse and with an echoing, hollow quality which is quite lovely when backed up by strings. While I really get off on the heavy horror aspects that Grace unleashes, the big surprise and the biggest enjoyment for me musically are the cues ‘No Way Home’, ‘Nine Miles’ and ‘The Last Winter’. These cues reveal a completely different side to Jeff Grace and prove he can do much more than scare the pants off you, he can move you as well. This is emotional stuff, veined with a sense of loss and deep struggle. Anton Sanko’s ambient contributions work well amongst Jeff Grace’s acoustics, though it’s always difficult to pick out moments in such music to comment upon. That said, he achieves a palpable sense of paranoia and some dread; though I’d take Grace’s orchestral trickery over the programmed stuff any day. 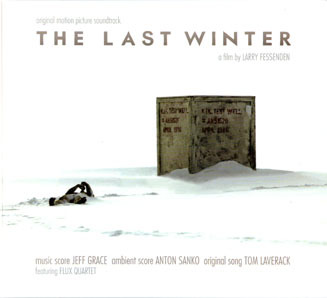 The album closes with a song by Tom Laverack, whose tracks regularly appear in Fessenden’s movies. ‘Running Out Of Road’ is a cool number, with guitars, sax and Laverack’s rough tones. An odd addition when played against the score, but a fine song on its own. The Last Winter is an accomplished piece of work. Jeff Grace again shows he’s got a exceptional handle on horror, while exploring other sides to his musical persona; all of which confirm my initial thoughts that this is a composer to take very seriously."